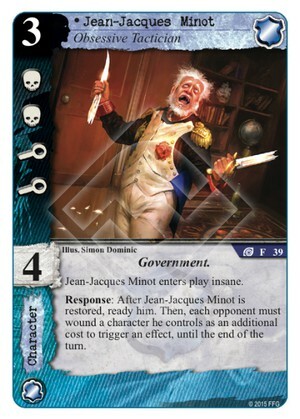 Jean-Jacques Minot enters play insane. Response: After Jean-Jacques Minot is restored, ready him. Then, each opponent must wound a character he controls as an additional cost to trigger an effect, until the end of the turn. Another way for Agency to block tricks and allow pure struggle superiority to prevail. Among the "positive insanity" characters from this box, he's just average though. 3/5. Anyone have any idea how this card works with your opponent's Forced Responses? Forced Responses don't typically have costs, so this card would create an atypical situation. I know you can't force an opponent to pay a cost, but this seems like one of those Golden Rule situations described in the rulebook where cards can create exceptions to the rules. It's easy if the opponent doesn't have anyone to wound - obviously, the Forced Response couldn't trigger. But if the opponent has the ability to wound, would a Forced Response require him to take the wound and proceed as normal? My guess is yes, but this seems like it creates one of those "unstoppable force, immovable object" dilemmas. You're either forcing the opponent to pay a cost, or you're saying a Forced Response doesn't have to trigger when its condition is met. Forced responses aren't triggered by the owner/controller of the card, they are triggered by the game. So this card would have no impact. FAQ 4.2: Section 1.11) A Forced Response must trigger, if able, and is not considered a player triggered effect, but is instead a card triggered effect triggered by the game state that is resolved by the player who controls the card.